I managed to get a fair bit of painting done today and the underpainting of her skin is completed. 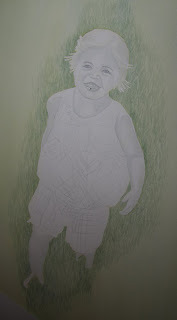 I will start building her skin tones now and laying in more details as I go. The masking fluid will come off her teeth soon so will look much less harsh and I will start to lift off some of the pencil lines as I get more of the details built up. I also took a photo of the colors I thought would look nice on her outfit. They are more muted than in the real outfit so they don't attract as much attention. The green also for some reason (the color next to yellow on the top right) did not come out in the photo as green as it is in real life so it would be a bit deeper leaning towards blue, not as bright a yellow-green as in the original outfit.